37 Results exactly matching the search phrase. 5 Results matching titles words. 36 Results matching product descriptions. 5 Results matching title or description. PAL B to VGA/ HDTV Tuner Box CSC-1200T. 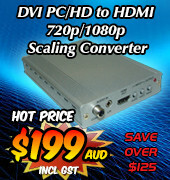 View VHF/UHF/Cable TV, DVD Movie and other videos on your PC monitor, LCD Project or large screen HDTV or Plasma TV. Only one piece "Used" stock available! The 5" car in-dash TFT-LCD colour TV provides a clear and sharp picture with 255 preset channels. The user can select the language that they desire from Chinese, Russian, English, Italian, Spanish, Portuguese, German or Arabic. The calendar function enables the year, month and day to appear on the screen, while the picture mode allows for the selection of screen modes between 16:9 and 16:9-1. Video CV-SV 4x1 Switch is designed to switch between Standard Definition (SD) Composite and Super video sources such as VCR's, DVD players and earlier model Gaming Consoles like XBox and Play Station, all to share onto one Composite or S-video enabled display. 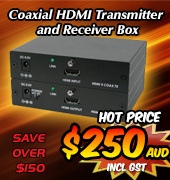 Supports standard Interlaced video and analog L/R audio sources of 480i and 576i resolution (NTSC and PAL). Control four SD video sources to display as required to the one screen, plus their associated analog L/R audio can be run to the TV speakers, or to an external Amplifier. 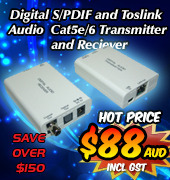 Ideal for multi-input addition to single input TV's. 7 Inch Delta FWXGA LCD Panel is designed to detect standard VGA, SVGA, XGA and FWXGA PC frequencies and standard PAL and NTSC Composite video formats and display all on a compact 15.4cm wide x 8.6cm high TFT LCD colour screen. Ideal for replacement of small CRT monitors and connects via a VGA 15pin Dsub cable, or a Composite video cable.